Privacy - B.J. 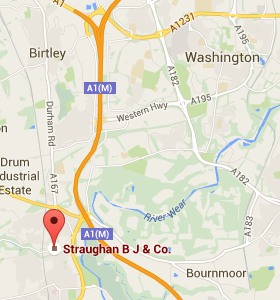 Straughan and Co.
B J Straughan and Co. is a general practice accountancy business of which Brian Straughan FCA is the sole proprietor. We provide a wide range of services including auditing, accounts preparation, tax compliance and advice and general business consultancy. Our clients include limited companies, charities, unincorporated businesses and individuals. The business is regulated by the Institute of Chartered Accountants in England and wales (ICAEW). Mr. Straughan is our data protection manager and is therefore responsible for assisting with enquiries in relation to this privacy notice or our treatment of your personal data. Should you wish to contact him you can do so using the contact details noted at paragraph 12 (Contact Us), below. We may also obtain data from third parties and/or publicly available resources (for example, from your employer or from Companies House). National Insurance numbers, tax codes, etc. Information we receive from other sources, such as information provided by your employer. We may process your personal data for the purposes necessary for the performance of our contract with our clients and to comply with their legal obligations.. This may include processing your personal data where you are an employee, subcontractor, supplier or customer of our client. any additional written form of consent which you may have supplied. We will share your personal data with third parties where we are required by law, where you have expressly authorised us to do so, where it is necessary to administer the relationship between us or where we have another legitimate interest in doing so. “Third parties” includes third-party service providers which may include the following: Solicitors, Independent Financial Advisors, Consultants (e.g. in specialist areas of tax, insolvency, etc.) and Banks. We may share your personal data with other third parties, for example in the context of the possible sale or restructuring of the business. We may also need to share your personal data with a regulator or to otherwise comply with the law or the regulatory framework operated by the ICAEW. We will not transfer the personal data we collect about you outside of the EEA except with your express permission. It is important that the personal data we hold about you is accurate and current. Should your personal information change, please notify us of any changes of which we need to be made aware by contacting us, using the contact details given below. If you want to exercise any of the above rights, please contact Mr. Straughan by telephone or, in the event of his unavailability, any other member of our staff. Any changes we may make to our privacy notice in the future will be provided to you in writing either by post or by email.